West Midlands transport authority Centro is a big supporter of the prying, nannying and hypocritical “smarter choices” agenda. What is Smart Network,Smarter Choices? • Reduce carbon emissions to help the region achieve its tough CO2 targets. The project will concentrate on ten key corridors/routes across the West Midlands implementing a range of schemes including: new or improved walking and cycling routes; small scale road and junction improvements; better passenger waiting facilities; expert travel planning for families, companies and schools; free travel support for job seekers; more mobile and real time transport information; and smartcard technology for cashless travel. The project sets out to help people make smarter and greener travel choices (Smarter Choices), especially for short trips, which in turn can cut congestion and improve traffic flows for essential road users such as hauliers and bus operators. To help bring about this change in travel behaviour, experts will work closely with families, schools, businesses and community groups to provide them with the bespoke support and advice they need. Smart Network, Smarter Choices will not only help support our regional economy but it can also bring substantial benefits for the environment as well as people’s health through more cycling and walking. Centro’s MyNetwork Personal Travel Plans site now includes various condescending documents telling people how they should travel, shop, and eat. The Great Barr Community Guide contains startling revelations such as the existence of businesses such as Acres Estate Agents, Barclays Bank PLC and Cashino Adult Gaming Centre, in the locality. Who’d have thought it. No doubt, Steer Davies Gleave and AECOM are also big supporters of “smarter choices” programmes. Because they were handed lucrative contracts to run them. And the sums involved, run into millions. This week High Speed 2, or HS2 to its friends and critics, has started the slow evolution to being rebranded, wrote Andrew Jackson. Why? Because the speed argument is a weak one and the public weren’t convinced. The Department for Transport say journey times between Leeds and London would be chopped by 50 minutes to one hour and 22 minutes while you can get to England’s second city Birmingham in 57 minutes rather than the two hours it takes now. That’s great but how many of the Great British public travel to London or Brum on a regular enough basis to make this important? The ambivalence of many to the cut in times on the proposed 250mph trains was indirectly proportional to the almost universal head-shaking, which went on when it was revealed that it would cost £32.7bn – which was then revised upwards by a third to a smidge under £43bn. The public then pointed out that we’ll be spending all this taxpayer loot, but if you don’t live in Leeds, Sheffield or Manchester (to name the points on the northern hub) then you’ve still got to get to the station. Although the Department for Transport is now talking down velocity in favour of capacity and connectivity, the fact remains that the whole design of HS2 was for speed, at the expense of capacity and connectivity. The PR may be changing, but the scheme isn’t. So the transport secretary thinks HS2 is really about increasing capacity on our railways? (Report, 11 September). Sorry, but if increasing capacity of the rail network is your prime objective then the laws of physics mean a high-speed railway is the worst possible answer. Why? Because the capacity of a railway is determined by the need to keep the trains a safe distance apart, and this distance is determined by the stopping power of the trains. The stopping distance of any vehicle is governed by its kinetic energy, and this quantity increases as the square of the vehicle’s speed. So if you double the speed of trains, you increase the minimum safe distance between them by a factor of four. Even though you’re going twice as fast, it takes twice as long to pass the longer safe distance at the higher speed, so the number of trains that can pass any given point in an hour (ie the capacity of the railway) actually halves. And no, you can’t get round this by making better brakes unless you want to fit your trains with seatbelts to restrain passengers against white-knuckle-ride levels of deceleration. The truth of the above is borne out by the fact that the highest-capacity railways are metro systems, where trains rarely exceed 40mph, but busy sections of line can pass 30 trains or more in an hour. By all means spend £50bn on improvements to our creaking rail infrastructure, but keep the speeds and costs per mile down if you really want to ease the misery of sardine-tin commuters. In March 2012, the Rail Freight Group (RFG) told the All Party Parliamentary Group for High Speed Rail (whose creation was orchestrated by Westbourne Communications) that RFG “supports the development of HS2 to deliver long term capacity for freight growth”. But now Lord Berkeley, RFG chairman — and backer of the (impractical) Euston Cross scheme — has criticised the government and HS2 Ltd for “bulldozing through” a badly-designed project which “just doesn’t link up properly with the existing transport network”. “The trouble is, ministers have got themselves into this position they do with every big project, where they say nothing’s going to change and we’re going to bulldoze everything through,” Lord Berkeley said. As well as disrupting freight traffic, HS2 will inconvenience millions of passengers, forcing them to change trains or even change stations for journeys which can currently be made direct. In April 2013, the Beleben blog pointed out that HS2 would release little capacity on existing lines, even though proponents of the scheme, such as Centro and West Yorkshire PTE, have long claimed that it would transform capacity with ‘more regional, local and freight services’. HS2 connectivity is fundamentally limited by the design constraints imposed by Andrew Adonis, and those limitations are largely immutable (without binning the specification). 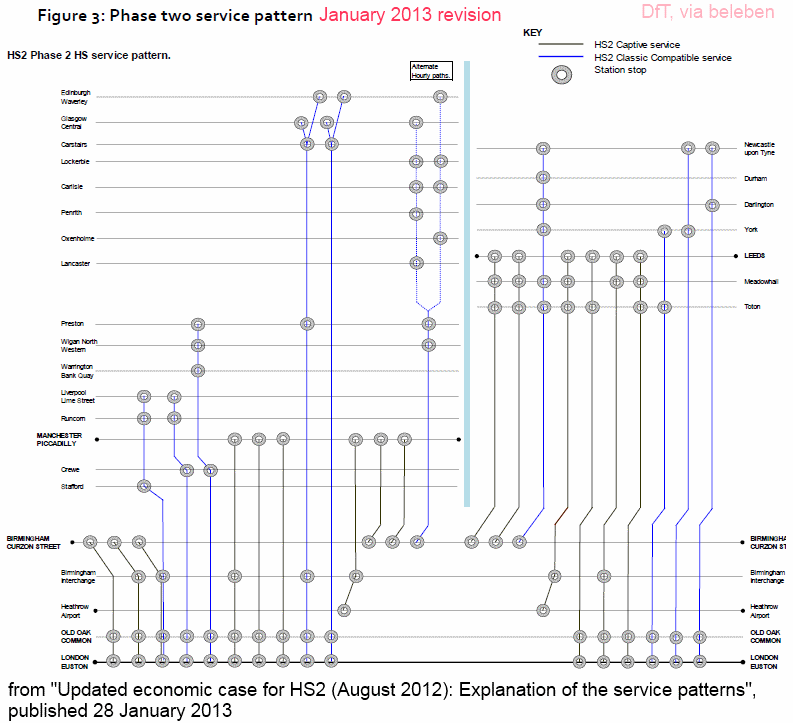 Even so, it’s surprising how inept HS2 Ltd’s January 2013 illustrative service pattern was, with Carlisle, the Lake District, and Lancaster shown as having no direct service to London.